You’re about to learn all you need to enjoy watching and shooting one of the best late-night shows served by nature: Meteor Showers. Meteors are caused by streams of cosmic debris entering the Earth's atmosphere at extremely high speeds. Smaller fragments burn in the atmosphere producing a “shooting star”, but the bigger ones can really produce an amazing big fireball. And when the space rocks (meteoroids) of the Perseids, the Geminids or any other powerful meteor shower enter Earth’s atmosphere, you’d better be ready for a great night of shooting stars. "Find your way in the dark"
Get the whole Meteor Showers ebook for FREE now! Where to look or frame: the radiant? Pay attention to the Moon phase percentage during the peak night. The more phase the worst conditions for the watching and shooting. As you see on the table, moonlight will be blocking the Lyrids, Perseids, Leonids and Geminids. While, the conditions will be great for the Quadrantids, Eta Aquariids, Delta Aquariids and Orionids. Finally, the table also provides both the Radiant and constellation of origin of each meteor shower to help you know where to look or frame your camera. 2.Where to look or frame: the radiant? During the meteor shower, you’ll observe that meteors radiate from one point in the night sky. This spot is called the radiant. Each radiant (the point of origin from where the meteors appear to converge) is located within or near the constellation that give the name to the meteor shower. For example, the radiant of the Geminids meteor shower is located in the constellation of Gemini, near the Castor star, one of the brightest stars in the night sky. But you don’t have to look in the direction of the meteor shower's radiant point to see the most meteors. Meteors can appear in all parts of the sky. If you decide to introduce the radiant point in your frame and trace the path of the meteors backwards, you’ll realize that all meteors appear to converge to one single spot in the sky. In this case, if you're lucky enough to capture many meteors, you can create a stunning effect by using the technique described in this video by David Kingham for image post-processing. By using David’s technique, Antoni Cladera (aka, the Photographer) could built the awesome cover image of this article. I love this effect. How can you locate the radiant? The position of the radiant in the sky is defined by two coordinates: Right Ascension and Declination. Declination is the vertical angular distance between the center of a celestial body and the celestial equator. A declination of +20° means that the celestial body is located 20° north of the celestial equator. The south polar cap is at a declination of –90°, the equator is at declination 0°, and the north polar cap is at a declination of +90°. Declination is to a celestial globe as latitude is to a terrestrial globe, a vertical positioning of an object. Right Ascension is the angular distance measured eastward along the celestial equator between the vernal equinox and the celestial body. Together with Declination, it defines a position of a celestial body in the sky. It is measured in hours (1h equals to 15°), minutes and seconds. Once you’ve located the radiant in the sky for both the beginning and the end of the shooting, you’ll know exactly the path the radiant will follow. Then, you'll be able to frame at the right area of the sky to create an image with the same effect than David Kingham's. The Quadrantids, well known for their bright fireball meteors, which produce larger explosions of light and color, are also known to be tricky. With a Zenithal Hourly Rate (ZHR) reaching 120 meteors per hour, the Quadrantids could be the most powerful shower of the year. But it turns out that the peak only lasts a few hours, which makes it difficult to catch. The shower runs from December 28 to January 12. The best night for the watching is the one between the 3 and 4 of Januray. The Peak has been predicted for January 4 at 2:23am UTC. This is a great year for the Quadrantids, the Moon, with a phase of 4%, will let us enjoy the show. Unfortunately, this meteor shower is only visible from the northern hemisphere. These meteors are not visible from the southern hemisphere. With a Zenithal Hourly Rate (ZHR) of just 20 meteors per hour, the Lyrids is an average shower. It runs from April 14 to 30. The best night for the watching is the one between the 22 and 23 of April. The Peak has been predicted for April 23 at 12:32am UTC. This meteor shower is visible from both hemispheres. Although it’s weaker in the southern hemisphere. The Eta Aquariids is known for its high percentage of persistent trains, but few fireballs. It’s usually a very active meteor shower when viewed from the southern tropics. Its Zenithal Hourly Rate (ZHR) is 55 meteors per hour, but it gets down to 10-30 from the equator northward. It runs from April 19 to May 28. The best night for the watching is the one between the 6 and 7 of May. The Peak has been predicted for May 6 at 2:02pm UTC. Trying the night before and after is also a great idea. This is a great year for the Eta Aquariids, the Moon, with a phase of 1%, will let us enjoy the show. The meteor shower is best visible from the southern hemisphere. It’s also visible from the northern hemisphere but at a lower rate. As it happens with the Eta Aquariids, it’s better to watch this shower from the southern tropics. With a Zenithal Hourly Rate (ZHR) of 20 meteors per hour, do not expect to see many meteors. It runs from July 12 to August 23. The best night for the watching is the one between the 30 and 31 of July. The Peak has been predicted for July 30 at 5:21pm UTC. This is a great year for the Delta Aquariids, the Moon, with a phase of 6%, will let us enjoy the show. The meteor shower is best visible from the southern hemisphere. But it’s also also visible from the northern hemisphere but at a lower rate. The Perseids is considered to be the best meteor shower of the year. With a Zenithal Hourly Rate (ZHR) of above 100 meteors per hour, the night of the peak is usually epic. It runs from July 17 to August 24. The best night for the watching is the one between the 12 and 13 of August. The Peak has been predicted for August 13 at 7:05am UTC. It’s a good idea to give it a try also the nights before and after. The meteor shower is visible and intense in both hemispheres. The Orionids are associated to the comet 1P/Halley, the same that’s associated to the Eta Aquariids in May. It’s an average shower with a Zenithal Hourly Rate (ZHR) of just 20 meteors per hour. It runs from October 2 to November 7. The best night for the watching is the one between the 21 and 22 of October. The Peak has been predicted for October 21 at 11:26pm UTC. This is a great year for the Orionids, the Moon, with a phase of 45%, won’t be a problem. Just use PhotoPills to check the time the Moon will set in your location and get ready for the show. The meteor shower is visible in both hemispheres. The Leonids has a peak above 100 meteors/hour every 33 years. The last great peak occurred in 2001, so we’ll have to wait until 2034! Usually, It’s an average shower with a Zenithal Hourly Rate (ZHR) of just 15 meteors per hour. It runs from November 6 to 30. The best night for the watching is the one between the 17 and 18 of November. The Peak has been predicted for November 18 at 4:46am UTC. The Moon, with a phase of 69%, will be an issue this year. It might block part of the meteors. So, use PhotoPills to check the time the Moon will set in your location and get ready for the show. The meteor shower should be visible in both hemispheres. For many astronomers, the Geminids is considered to be the queen of the meteor showers. The comet 3200 Phaethon is the cause of this meteor shower. With a Zenithal Hourly Rate (ZHR) of +120 meteors per hour, you can expect to see a good number of bright meteors. It runs from December 4 to 17. The best night for the watching is the one between the 14 and 15. The Peak has been predicted for December 14 at 6:39pm UTC. It’s visible from both hemispheres. Although it’s weaker in the southern hemisphere. Location: Go into an area with little light pollution. Framing: Make sure you’re framing the right area in the sky. You can use PhotoPills’ Night Augmented Reality tool to locate the radiant of the meteor shower. 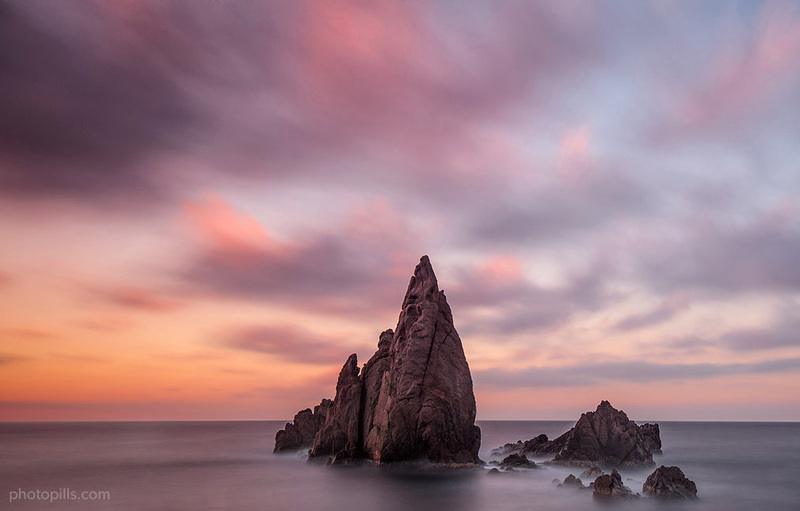 Focal length: Use the widest angle lens possible (at least 14mm) to capture the most area of the sky. Aperture: Use a fast lens to collect as much light as possible. An aperture of f/2.8 is great. Focusing: Focus at the hyperfocal distance. Make sure you’re not focusing at a shorter distance, because you’ll get stars completely blurred, even if you miss it by one inch (2.5cm). It’s much better to make focus exceeding the hyperfocal distance by 2 feet rather than falling short. You can calculate the hyperfocal distance with our on-line Depth of Field calculator. Also, learn all you need to know about hyperfocal distance and depth of field with our extremely detailed DoF Guide. ISO: Set the ISO to the maximum level that your camera allows without getting excessive noise (ISO 1600 or higher is recommended). Exposure time: Use PhotoPills' on-line Spot Stars calculator to calculate the maximum exposure time to get stars as bright spots. Usually, you’ll get a value between 20 and 35 seconds, depending on the camera and lens used. White Balance: With no light pollution, I recommend you to use a WB between 3,400K and 4,000K. Interval: Use a shooting interval between 2 and 5 seconds to try to capture the maximum amount of meteors. Regarding the equipment, in Step 7 of our tutorial “How to Shoot Truly Contagious Milky Way Pictures”, you’ll find all you need no matter your level of expertise or budget. Make sure to take a look at it. But, knowing the camera, lens and tripod you’ll need is only the beginning. I recommend you to also bring with you at least one heater strip to fight dew back! One of the most annoying aspects of night photography is dealing with dew. Moisture in the air can condense on the cold front surface of your lens, and ruin the photos. Getting a heater strip is a great way to save the night. The good news is that heater strips are very cheap (see again “Equipment against moisture” in step 7). Perhaps, the two most popular heater strip brands are Dew-Not and Kendrick. I use a Dew-Not 3" DN004, which perfectly fits my Nikon 14-24mm f/2.8. This model has a length of 13" (33cm), enough for the diameter of the lens. Make sure you buy a strip that can go around the entire circumference of the lens. You’ll also need a portable battery and a cable connector. Dew heater Dew-Not 3" DN004 connected to a portable battery. Need more help? Take a look at our articles How To Shoot Truly Contagious Milky Way Pictures and The Definitve Guide to Shooting Hipnotic Star Trails. You'll learn everything you need to imagine, plan and shoot stunning photos of the stars. And if you wish to learn face to face with us, the whole PhotoPills Team, along with a selected group of photography masters, don't miss the PhotoPills Camp! 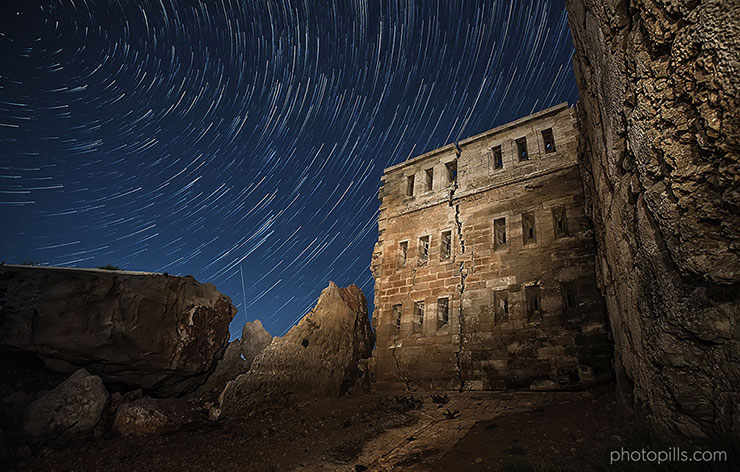 From stacking a great number of photos to create David Kingham’s effect or a powerful star trails image, to putting together a timelapse video, spending the whole night shooting a meteor shower can be very productive from the creative side. 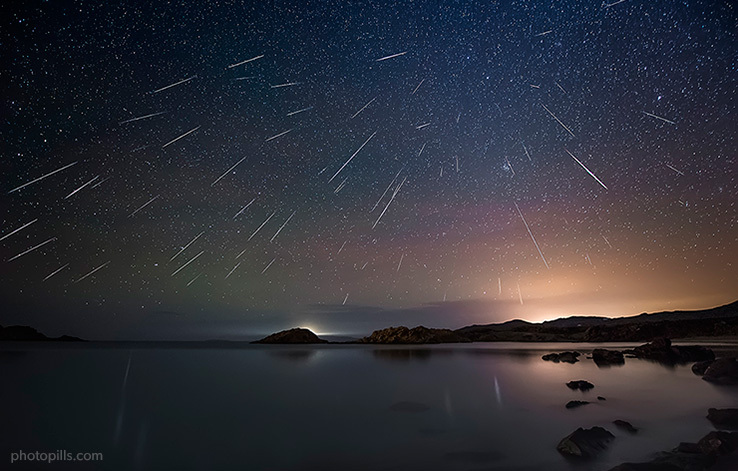 The following images and videos are the outcome of the Geminids Meteor shower in 2015. It was on Monday, December 14 2015, around 10pm local time, when the clouds disappeared from above our heads, leaving us face to face with one of the most active meteor showers we remember. We spent the next 5 hours shooting and enjoying the show. What an epic time! You can create stunning star trails by merging a series of short exposure photos into a single image using softwares like StarStaX (Mac, Windows, Linux) or Startrails (Windows). You never know what your camera will capture during the night. Each night scape is a different adventure. The image is the result of stacking 120 photos using David Kingham’s technique. To create this stunning effect, every photo has been rotated around Polaris to keep the radiant point of the meteor shower in the same place. This proves that all meteors appear to converge from one single point in the sky: the radiant. To be featured on Instagram (@photopills), have the chance to become the next PhotoPiller of the Month or even the PhotoPiller of the Year and win up to $6,600 in cash prices, participate in the PhotoPills Awards... and become a Legend! Many PhotoPillers have already been featured. See all the photos on our Instagram or within the PhotoPills app (PhotoPills > My Stuff > Awards). All photos in this articles have been taken by Antoni Cladera. All you need to know to put depth of field into practical use in one single place. This complete guide will help you learn how to use depth of field to tell stories that win hearts and minds, regardless of your level of expertise.